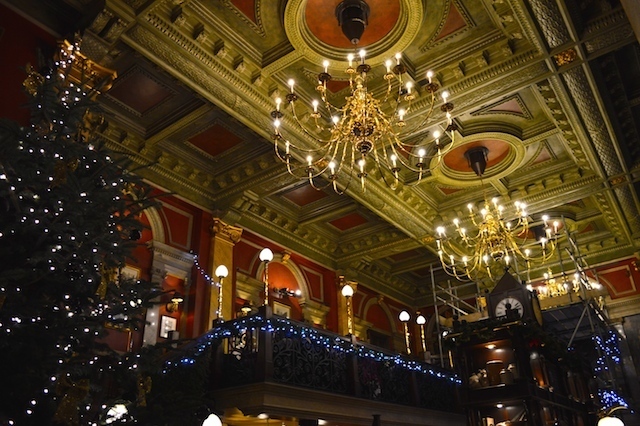 You could quite easily run a crawl of former banking halls turned pubs in London. Round the corner, you'll find the vast Wetherspoon house The Knight's Templar, while in the Square Mile proper you can knock back a pint in the magnificent old Counting House, the Crosse Keys or Hamilton Hall. The Old Bank of England is the grandest of the lot, and is indeed an old offshoot of that institution, formerly used as an adjunct to the Law Courts until the 1970s. The pub's website boasts of vaults beneath the pub that once contained bullion, and even the Crown Jewels for a short time. There's also a dubious connection to the Sweeney Todd legend, this being the part of Fleet Street where the demon barber supposedly (but not actually) plied his bloody trade. Back up to bar level, you'll not find a more opulent ceiling anywhere in pubdom, and the wall paintings reward inspection. The best seats are to be found on the mezzanine level, where you can look down on the punters packing in below. Despite its size, this place can get very busy, especially when the ancillary seating areas are closed for private functions. It's a Fuller's pub, so expect the usual range of beers and food.